For the last time! Who ate my sandwich?!? One of my personal goals for this blog when I was first constructing it was to post designs for League of Legends champions, items, and game modes. When I first read about where champions came from in League of Legends it was pretty clear that the answer was Anywhere. Champions come from cities, farms, mountain villages, deserts, jungles, and out of the ocean. They can come from more exotic places too like the distant past or other dimensions. Kayle and Morgana come a dimension populated by angels. Lots of champions come from The Void. Malphite comes from a rock dimension. You get the idea. So why couldn’t a champion come from an alternate dimension like Star Wars? There’s a precedent for this kind of crossover in other games. There’s a whole wikipedia article on crossovers between video games. For Star Wars specifically, Soul Calibur IV had Yoda, Darth Vader, and Starkiller in it. So there is room in League of Legends for crossover characters if Riot decides to go that route. It could be Link, Donkey Kong, Master Chief or Darth Vader who I’ll be designing today. One issue with making a Darth Vader champion is there is already a character very similar to Darth Vader within League of Legends. That character is Kassadin. I don’t mean similar in story or personality, Kassadin is nothing like Anakin Skywalker. I mean in terms of what that character can do. Darth Vader has an ability to choke people from a distance. Kassadin can interrupt what people are saying from a distance. Darth Vader has a shining lazer sword. Kassadin has a shining lazer sword. Darth Vader can summon powerful winds (remember when that whirlwind hits Luke in The Empire Strikes Back?). Kassadin can throw out magical energy that slows people down in a cone close to him. 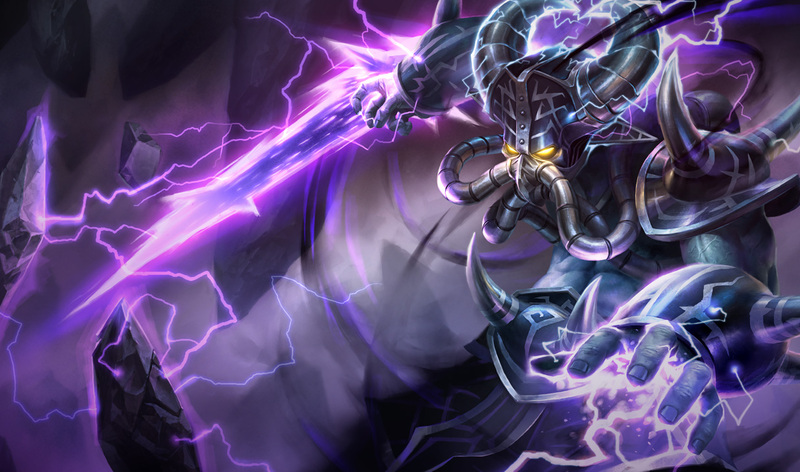 So how do we differentiate a League of Legends Darth Vader from Kassadin? Let’s just go through the abilities I had in mind for Vader and see how they compare. Passive (The Imperial March): When Vader attacks an enemy champion all allied minions with an attack range within 100 of that champion will also attack that champion for the next 2 seconds. The minions will lose aggro if the target gets more than 200 outside of their attack range. This ability has a cooldown per champion targeted of 12 seconds (like Nautilus’ passive). This ability brings in a little of the stormtrooper element of Vader’s strategies in the movies. He gets the little guys to do his dirty work. The minions still have to move in range and complete their attack animations though, so there is some ability to escape the minion assault. Plus, Vader’s minion won’t be attacking the opposing wave, resulting in the opposing wave pushing in. I’d like to say that I can predict how this passive would play out in actual games, but I can’t. Is it broken? Is it awful? I can’t say. The good news is the passive fits thematically and it is unique, making the gameplay of Vader easily identifiable, even if he’s not using his abilities. 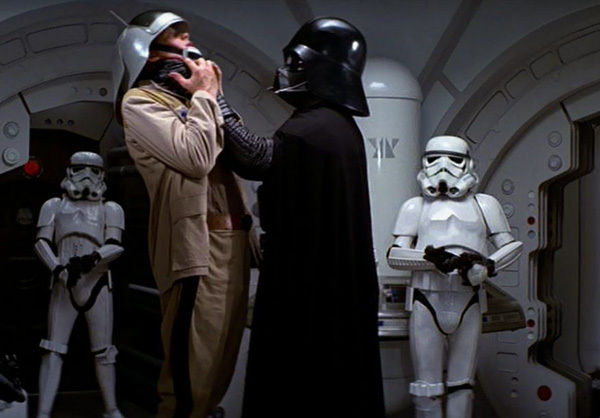 Q (Force Choke): Vader lifts an enemy off the ground with the Force and chokes them. This is a short ranged ability, probably 500. Vader will channel for 1 second while the opponent is knocked up and takes damage over the duration. The knockup can be interrupted if Vader’s channel is broken. The target takes damage over the channel that scales off Vader’s AP and the target’s missing health. The last tic of damage should be three times as much as the other tics. The last tic is supposed to be from the target hitting the ground, so it will trigger if Vader cancels Force Choke or is interrupted. The ability refunds half its mana if it kills the target. Force Choke will have a short cooldown of about 6 seconds. The base damage on this ability would be pretty low so that Vader either has to rely on the execute part of it or the AP part late game to get any use out of it. The knockup will be almost useless to Vader for trading in lane because he can’t do anything during the channel either. The short cooldown will allow Vader to CS with it against ranged champs that might zone him. In team fights it should be a great initiation tool, but it has the drawbacks that Vader must expose himself when using it and CC on Vader will interrupt the knockup. W (Dark Side Fury): Vader draws additional power from the Dark Side of the Force and channels it into his weapon. His weapon crackles with purple lightning and Vader gains increased AD and attack speed for the next 6 seconds. His next auto attack is also empowered to deal additional magic damage scaling off his AP. There were other ideas considered for this ability slot, but none of them fit the overall concept as well as a simple steroid. Throwing Vader’s lightsaber was one idea as he does that in Return of the Jedi, but Vader should be a melee champion and giving him what is effectively a ranged auto didn’t seem right. I also considered an ability called Turn to the Dark Side that taunted an enemy champion, but that really put too much CC power in Vader’s hands. Force Gale was also considered for this slot, but my friends convinced me that it belonged as an ultimate. The auto attack empowerment matches the lightning enhanced attacks and the Force Fury mechanic in the Force Unleashed games. At first I felt uneasy about this because Vader never uses lightning in the movies, but if professionals designed Vader with this ability in Force Unleashed then maybe I should too! E (Feel the Force): For the next 3 seconds Vader uses his lightsaber to deflect all incoming ranged auto attacks, effectively dodging them. During those three seconds Vader also reveals all enemy champions within 1,500 of Vader. As this ability all but nullifies ganks it would have a long cooldown on the order of 30 to 60 seconds. R (Force Gale): Vader stands still and shoots a wind gale in front of him. All enemies in the gale are pushed back 150 and a zone is established while Vader continues to channel the ability that slows enemies moving towards Vader and deals damage to all enemies within it. This is that power that Vader used to throw a bunch of stuff at Luke in the fight before he says, “I am your father.” He also throws other stuff with the Force at other times in the movies and all the time in the Force Unleashed. Force Gale is basically a weaker form of Rumble’s Equalizer because it deals damage over time and slows in a linear area. The area in which Vader can place the Force Gale is more limited than the Equalizer though. Vader acts as one of the ends of the line. This ability could be used for damage in combination with other champions like Amumu or it could be used to zone people in a team fight. How do you play Vader? He is an AP bruiser who is best suited for Top lane or Jungle. He could work as a Support as well. Hard to say without getting to play him. A basic combo for Vader would be to walk to an enemy champion during laning phase and auto attack that champion. This sets off his Imperial March passive. He follows up with Force Choke while the minions attack. When the enemy champion lands, Vader hits them with a Dark Side Fury auto attack. Then, depending on the situation, Vader can give chase with his enhanced autos or retreat now that his combo is done. In teamfights Vader provides short cooldown CC with his Force Choke. He has a strong battlefield control option with his Force Gale and in rare situations it can be used to snipe fleeing opponents. Feel the Force gives Vader a tool for fighting ADCs as well. His weakness lies in his lack of mobility. Vader never moves quickly in the games or the movies. He walks freaking everywhere all the time. While his ultimate is strong if used in the right place, Vader has to position himself in the right place. Mixing that positioning with Vader’s strong kit will separate the good Sith Lords from the great Sith Lords. Tadah! There’s my first idea for a League of Legends champion! I think Darth Vader will play and feel quite different than Kassadin. Their laning phases are differentiated by Vader’s passive and Kassadin becomes an assassin upon getting his ultimate while Vader gains more CC to solidify his tank role. Thanks a lot to my friends who gave me feedback while I was coming up with the idea. You know who you are! P.S. If this post has made you interested in playing League of Legends you can try it out by clicking this link.